On the same day I rode up to Birmingham to test ride the Yamaha MT-07 I also got a chance to putt around on the larger-engined MT-09. Both bikes look the same and both have bland names (I am never quite sure why so many motorcycle companies fail to give their bikes actual names, rather than letter/number codes) but their essence is different. Engine is what I mean by essence. Motorcycles, after all, are mostly engine. That's part of the appeal, I think. There's something so delightfully idiotic about it. Someone has taken an engine and done little more than strapped some wheels to it, and with that you are free to hurtle yourself down roads. It makes you feel a bit like Slim Pickens riding an A bomb. So, the real essence of any motorcycle -- what makes one motorcycle truly different from another -- is its engine. 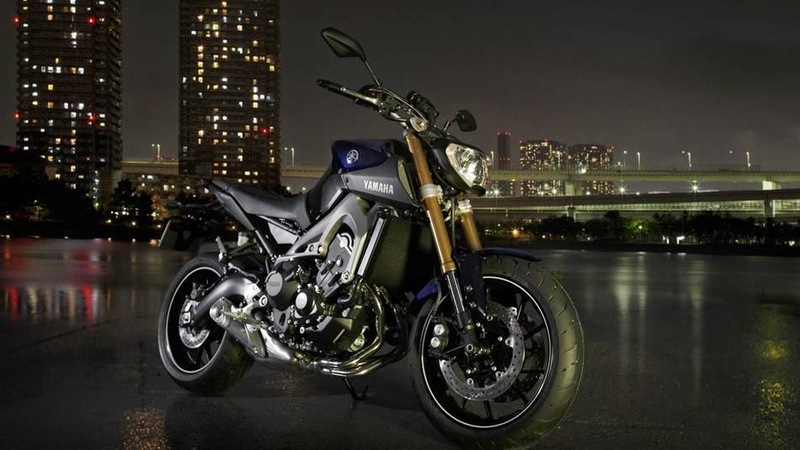 The MT-09 has a three-cylinder engine, which is supposed to be the happy middle ground between the feels-like-you're-on-a-tractor pull of a twin (i.e., the type of set-up used by Harley-Davidson machines) and the feels-like-you're-driving-a-Toyota smoothness of an inline four (i.e., the type of set-up used on my Honda). It's supposed to be fun and fast. That's not what I found in the MT-09, though. Click the link below to read the post.